Music is an important part of every person's life. But relatively few children have the opportunity to learn the language of music...to understand it...to actually play it. For you child, that opportunity is now available. REASONS TO JOIN THE J-L AREA SCHOOLS BAND! Just listening to music is fun, and yet it's even more fun to create. There is a simple joy in experimenting with an instrument, in playing real notes and melodies, and in performing as part of a band. Most importantly, your child will know the pleasure and satisfaction that comes from meeting and handling each new venture. When your child plays a musical instrument, he/she will be creating something that reflects individual personality and style. The creativity will also strengthen independent thinking in may areas besides music. A recent national research survey reveals that students in school music average higher grades in all subjects and develop faster academically than other students. Every child needs to seek recognition. With every new success, your child gains more stature and prestige while at the same time realizing their own potential and self-esteem. In band your child becomes part of a group that depends on teamwork and cooperation. Good relationships with others result from sharing a common background and interests. Playing music is a wholesome, productive activity as well as being fun. "Music is the universal language of mankind," said Longfellow and the learning of the "language" opens endless possibilities. First, of course is participation in a beginning band class. Later there are band festivals, concerts, parades, honors band, music camps, solo and ensemble festivals and trips. Most large communities (such as Gaylord) have bands for adults who wish to keep playing instruments. Regardless of where music takes your child, he/she is certain to benefit from the ability to play an instrument throughout life. Band provides a means of individual expression and enjoyment that can never be outgrown. Mrs. Nieman wants you to join the new IMPROVED J-L BAND!!! *Band vs. Staff/Parent: Basketball, Dodge ball, etc. JOIN THE J-L BAND TODAY! approach it very seriously only is not enough. at the same time, with a great affectionate joy. 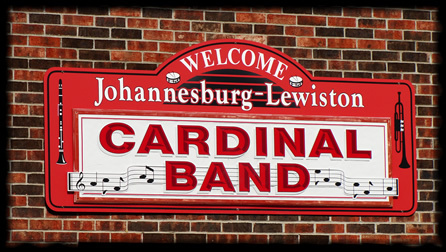 The Johannesburg-Lewiston Area Schools Band Program is in need of used instruments for students who are not able to rent/buy their own. Participating in Band is a rewarding learning experience, which teaches not only music but also responsibility and leadership.